I recently spent a week as a visiting postdoctoral researcher at the Built Environment and Health (BEH) research group at the Mailman School of Public Health at Columbia University. My visit was funded by the University of Glasgow’s Principal’s Early Career Mobility Scheme, a scheme which aims to give the opportunity for postdoctoral researchers to visit international institutions, providing the time and space to develop high-impact collaboration with staff there. I organised the visit and developed a proposal on how I would spend my time at Columbia with Kathryn Neckerman, a senior research scientist at the Columbia Population Research Centre and co-director of BEH. Now I am back, it’s time to reflect. Why is international research collaboration important? Improving population health and well-being is a focus of Governments and health organisations globally and, while there is continued focus and resource, poor health and inequalities remain. This is partly because improving health and well-being, and reducing inequalities is complex and requires complex solutions. Professor David Hunter in an article in the Journal of Public Health describes improving health and well-being as a ‘wicked problem’. A ‘Wicked’ issue in the sense these problems “defy easy or single bullet solutions” and “have complex causes and require complex solutions”. Collaboration is vital to bring together ideas and resources to tackle complex problems. An article on international research collaboration in Elsevier connect, following the Times Higher Education World Academic Summit in Melbourne in 2015, stated that “researchers collaborate to share their knowledge and combine the perspectives they have to solve complex problems that are increasingly cross-disciplinary in nature”. It argued that international collaboration provides many benefits, including “enabling researchers in institutions to access resources beyond their own, especially funding, talent and equipment”. Furthermore, the article suggested that regional universities could collaborate when research is centred on a common regional challenge. However, there are further opportunities for international collaboration and learning, such as where research themes and methodologies are overlapping. All this potential was in mind as I travelled to Columbia University and I was able to explore this through my visit to BEH. For me, the question was how could the similarities that exist in Neighbourhood and Health research themes in Glasgow and in New York benefit research and help further understand complex problems. The BEH research group has an interdisciplinary programme of research which uses spatial data to examine the impact of the built environment (including land use, public transit, and housing) on physical activity, diet, obesity, and other aspects of health. The group’s research themes have many parallels to ours in the Neighbourhoods and Communities Programme at the MRC/CSO Social and Public Health Sciences Unit (SPHSU), University of Glasgow, and at the Centre for Research on the Environment, Society and Health (CRESH). We all seek to understand how neighbourhood environments impact upon health outcomes and health inequalities. For example, researchers at SPHSU and CRESH have recently described an association between alcohol and tobacco outlet density across Scotland and area level deprivation such that the poorest neighbourhoods had the highest densities of outlet. However, this is a complex issue as highlighted by a Glasgow based study conducted at SPHSU, ‘The socio-spatial distribution of alcohol outlets in Glasgow city’, which did not find the same association. My colleague Laura Macdonald’s recent paper described that perceptions of being well-placed for amenities and the presence of amenities in the local neighbourhood were not necessarily correlated. In New York, BEH group have recently developed a tool that allows the automated auditing of neighbourhood environments using Google Street View. This project developed a system called the ‘Computer Assisted Neighborhood Visual Assessment System’ (CANVAS), to conduct Street View based audits of neighbourhoods. The software developed can be used for neighbourhood audits conducted at a desktop computer for a much lower cost than sending out trained auditors to survey the neighbourhood. CANVAS creates opportunities a richer understanding of neighbourhood environments than using only the geographical location of amenities or outlets. This could include an understanding of visual stimuli in the neighbourhood on individual behavioural choices, such as advertising of health/fast foods, whether amenities and outlets are visible to individuals travelling along streets, and changes in this over time. Approaches like CANVAS could bring advances in our field which often currently assumes that proximity to facilities is the primary mediator in access. As our research has shown, perception and presence of amenities are not necessarily correlated. Our programme has recently completed data collection for the Studying Physical Activity in Children’s Environments across Scotland (SPACES) study. The SPACES study is the first national representative study in Scotland to collect both Global Positioning System (GPS) and accelerometer (i.e. movement) data of over 800 children, 10-11 years old. Indeed, a study I am currently leading utilises the SPACES dataset to describe children’s patterns of movement within the landscape and how this may be affected by the surrounding neighbourhoods in terms of its makeup, size, shape and proximity to each other. Paul McCrorie and colleagues’ review the use of such devices to explore the physical activity and environment relationship in children and young people highlighted that describing people’s movement in time and space is a field which is advancing rapidly, driven by the advancements in wearable technologies that collect GPS data. But this also means that it’s imperative we understand and develop the methodological options for analysing the gathered data to ensure robust and generalizable conclusions. Spending time with BEH, I could more readily see that the two programmes share a clear focus to establish a grounded and robust methodological framework for describing patterns of movement and environmental exposures in neighbourhoods. It was this first-hand opportunity to share learning both from the analysis of our studies and our approaches which can, I believe, lead to better collaboration. Modern technology is great for communication, but direct dialogue and the time and space to be with potential colleagues in their environment can perhaps offer richer experience than a scheduled video-conference or a meeting of minds at a conference, (valuable as those are). For example, last year the BEH group published a study using GPS data to study neighborhood walkability and physical activity’ in the American Journal of Preventive Medicine. This measured the size and characteristics of residential neighbourhood areas utilised, and those not utilised, by people in New York City. I was able to discuss this with the lead author, Andrew Rundle, who is also co-director of BEH, during my visit and the strengths and limitations of different geospatial analytical and statistical techniques for neighbourhood GPS studies, which I also picked up with Stephen Mooney while I was there. I am now continuing to explore ideas around methodological development and carrying on these discussions. International travel schemes are invaluable. It is important to step outside of your own research group to gain a wider academic perspective of world-leading research. Although my visit to BEH was not about collaboraton in the sense of producing a research paper or grant, it allowed us to share practice, knowledge and ideas. Of course, embracing an international spirit also means following the ‘when in Rome’ philosophy, so before I left, as a keen runner, I also made time to tread some miles amongst the amazing New York scenery. And as a geographer interested in spatial epidemiology, and like other geographers, I track all my runs using GPS! 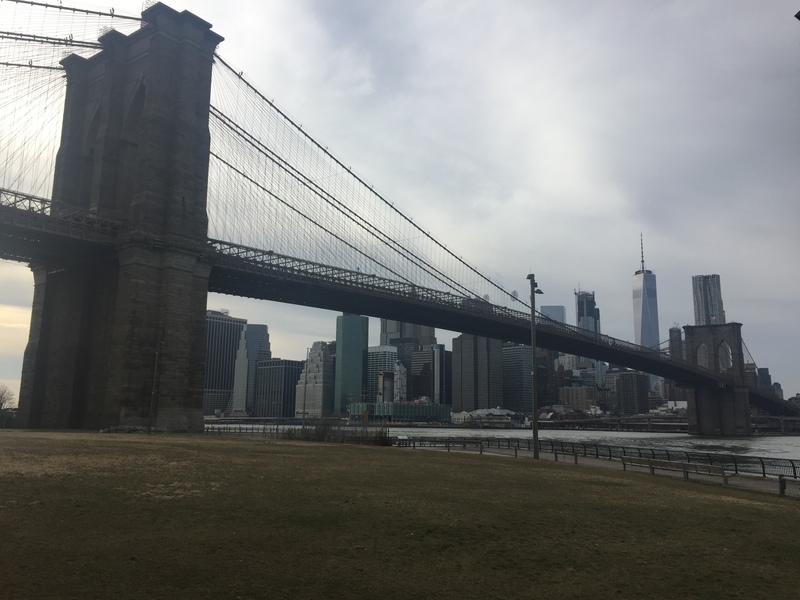 I have included the routes for those who might want to check them out: Two Bridges, Lower Manhattan to Battery Park, and a foggy 5k across the Manhattan Bridge.